“Oooooh, I heard it through the grapevine!” Remember those adorable (creepy?) dancing raisins from the 80’s? Well, this experiment isn’t going to get your sun-dried grapes to dance around on stage with a guitar, but it is pretty neat to see. With just two simple ingredients that you probably already have in your kitchen, you can get this party started! Pour soda into the glass. After about a minute, you will observe raisins moving up and down in the glass. 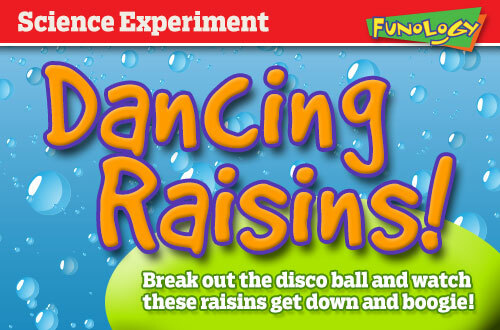 Watch how the bubbles control the movements of the raisins! What makes the raisins dance? The soda water has lots of carbon dioxide, which makes the liquid bubbly. When the raisins are put in the soda, the carbon dioxide molecules collide with the raisin and build up in the raisin’s nooks and crannies. The carbon dioxide is less dense than the the raisin, and when enough bubbles join together, they attempt to lift the raisin to the surface. Some of the bubbles burst or disengage from the raisin, and the buoyancy is lost until other bubbles move in to take their place and then the raisin tries to float up once again, making the raisin bounce around in a funky dance!